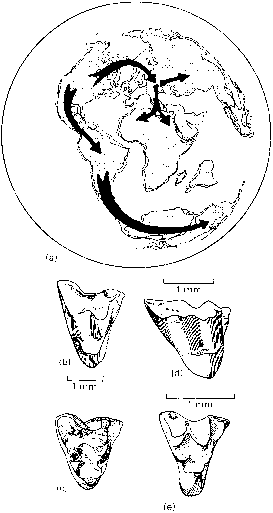 Marsupials probably arose in the Early Cretaceous of Asia (see p. 308), and they spread from there to North America and then to South America and Australasia (Szalay, 1994). It has generally been assumed that the Australian marsupials form an essentially distinctive clade from those of the Americas, and this is confirmed by recent molecular analyses (Amrine-Madsen et al., 2003). For years, the split distribution of marsupials was a mystery and numerous biogeographical theories were proposed. Some time in the early Tertiary, North American didel-phid marsupials spread to Eurasia (Figure 10.15(b)), where they survived until the Miocene, and Africa (Figure 10.15(e)). In North America, the didelphids became extinct in the Miocene,but they reinvaded from South America much more recently. Marsupials are known in Australia from the early Eocene onwards. The present split distribution of marsupials has led to much debate among biogeographers. Before 1960, a northern dispersal route was generally favoured, with the early marsupials travelling across Asia from North America to Australia in the early Tertiary, but no evidence of marsupials had been found in Asia up to that point. With the acceptance of continental drift (see pp. 26-8), most people preferred a southern dispersal route from South America to Australia via Antarctica. Now, several South American types of marsupial have been found in the early Tertiary of Antarctica and these confirm the likelihood of the southern dispersal route. have been interpreted very differently by a northern dispersalist! Australian marsupials form a clade, the Australidelphia, broadly distinct from the South American marsupial clade. One surprise, however, has been the finding that one South American mammal, the small monito del monte and its extinct relatives (Microbiotheria), appears to associate with the Australian, rather than the South American, clade (Szalay, 1994; Springer et al., 1998). Convergence between Australian marsupials and placentals from other parts of the world is often striking. For example, the recently extinct marsupial 'wolf' Thylacinus has a skull that seems at first sight to be identical to that of the dog or fox (Figure 10.16(a,b)).It differs in details, however; the molars of Thylacinus have both shearing and grinding surfaces, whereas in Canis meat is cut and bones crushed by separate teeth. Similar convergences may be found in the marsupial moles, ant-eaters, climbing insectivores, leaf-eaters and even grazing ungulates (even though a kangaroo looks very different from a deer or antelope, it lives in roughly the same way). The fossil record of Australian marsupials extends back to the early Eocene (Archer et al., 1993), with more substantial remains from the late Oligocene onwards. The most spectacular faunas are known from the Pleistocene, when giant diprotodonts, kangaroos and others lived with giant echidnas and the heavily armoured turtle Meiolania (see p. 234), as well as the cow-sized varanoid lizard Megalania and the redoubtable snake Montypythonoides. 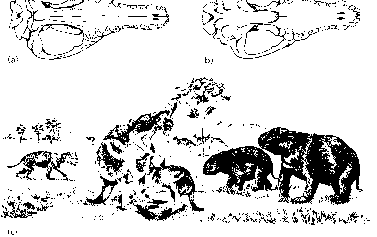 The scene (Figure 10.16(c)) was dominated by great herds of the bison-sized diprotodontid Diprotodon and its smaller relatives, the giant kangaroo Procoptodon and the marsupial lion Thylacoleo. 10.16(a)). The Tasmanian wolf became extinct in 1926 when the last captive example died in Hobart Zoo. The Peramelemorphia includes some 20 species of bandicoots and bilbis, the oldest bandicoot being perhaps early Miocene in age. The Notoryctemorphia contains the two living species of marsupial moles. The Order Diprotodontia is represented today by 117 species of possums (superficially like leaf-eating primates), gliding phalangers, wallabies, kangaroos, koalas and wombats. The marsupial lion, Thylacoleo, may be a phalangeroid. It is a well-known Pleistocene predator that fed on most mammals, although adult diprotodontids and giant kangaroos were probably safe from its attentions. The heavy 250-mm-long skull of Thylacoleo (Figure 10.17(a)) has strong canine-like incisors and exceptionally long flesh-cutting blades extending across two teeth. Kangaroos arose in the early Miocene and they achieved large size in the Pliocene. The short-faced Pleistocene kangaroo Procoptodon (Figure 10.17(b)) was a browser that used its powerful jaws to chew tough leaves and grass. Its skull is much shorter and deeper than that of a modern kangaroo. Like them, it has four toes, but the fourth is the only functional one (Figure 10.17(c)). Toes 2, 3 and 5 are reduced and they are firmly bound together by connective tissue, a condition termed syndactyly, which is seen in all Australasian marsupials except the dasyuroids. Procoptodon no doubt moved rapidly by hopping, just as modern kangaroos do, an efficient mode of locomotion that allows them to achieve racehorse speeds of 45-55kmh-1 over short distances. Koalas date back to the Middle Miocene. The modern wombats are related to the extinct Diprotodonti-dae. The diprotodontids arose in the mid-Miocene and survived into the Holocene: perhaps the last ones were hunted by early Australian aboriginals. Diprotodon (Figure 10.17(d)) has heavy limbs with broad plantigrade feet to bear its weight. The feet have powerful digits and deep claws and they may have functioned in scratch-digging for food. This gentle giant has a massive skull and its upper and lower jaws are armed with a pair of tusk-like incisor teeth at the front, and broader crushing molars set well back.